After all the talk, the Manchester derby delivered a thrilling encounter as Jose Mourinho and Pep Guardiola squared off against each other in the Premier League for the first time. In the end, it was Guardiola and Manchester City who came away with three points, and the bragging rights, as they claimed a 2-1 victory at Old Trafford. Strikes from Kevin De Bruyne and Kelechi Iheanacho in the first 36 minutes were enough for the Citizens, despite a Zlatan Ibrahimovic riposte, thanks to a Claudio Bravo error, prior to half-time. It was a thrilling and absorbing encounter, as two of the world’s best managers tried to outwit each other on the touchline, and Mourinho might not be too disappointed given his side’s second half performance, which nearly earned them a draw but saw a goal disallowed. A frenetic start saw some superbly swift passing moves from both sides as they looked for early openings at the Theatre of Dreams. Sadly for City, Kevin De Bruyne whipped cross evaded several bodies in the box, which allowed United to clear. Aleksandar Kolarov attempted to beat David De Gea with power as he took a free-kick just outside the box, but his left-foot strike fizzed over the crossbar. But soon Guardiola’s men were ahead with a move which started at the feet of debutant Claudio Bravo. The Chilean, a late signing to replace the out of favour Joe Hart, passed to Kolarov and the Serbian launched the ball upfield. A Kelechi Iheanacho flick-on left Daley Blind floundering and too deep, allowing De Bruyne to beat him to punch and, beyond the last man, he fired beyond De Gea. Frustrations boiled over and Wayne Rooney soon confronted Guardiola, who held onto the ball for a little too long after it had gone out of play, but a firm handshake soon had the duo on talking terms. Manchester United’s intentions were always going to be to use their pace to counter with devastating consequences, but twice their end product let them down, with Paul Pogba and Henrikh Mkhitaryan unable to find their intended targets in the final third. Marouane Fellaini struggled to get to grips with the game, losing the ball a number of times, while he also found himself involved in a row with Nolito after a tussle on the left flank. 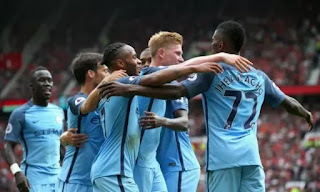 For all United’s feist, though, City made them pay with precision and skill and they went two up after 35 minutes as Iheanacho prodded home with ease when De Bruyne’s shot rebounded off the post. The Belgian star has been a huge success following his £55million move last summer and was putting on a real show in midfield, much to former manager Jose Mourinho’s chagrin. Perhaps the most surprising element of the first-half was the man who earned the game’s first booking, with David Silva scything down Antonio Valencia. But just as it looked like Man United would be entering half-time with heads down, narrative intervened in the only way it can. A free-kick into the box from Rooney should have been easy for Bravo to deal with, but he tangled with team-mate John Stones and dropped the ball, allowing Zlatan Ibrahimovic to show his divine technique with a stunningly executed volley, which crashed into the back of the net to make it 2-1. Sensing changes were needed, Mourinho swapped Ander Herrera and Marcus Rashford for Jesse Lingard and Mkhitaryan at the break. The impact was almost instant as, fresh off the back of his England Under-21 hat-trick, Rashford created a chance for Ibrahimovic, but the Swede could only scuff over, before missing with a volley just moments later. Never far from trouble, Fellaini was booked after catching Kolarov with his elbow, leading the duo to argue, while Guardiola swapped Fernando for Iheanacho as he attempted to counter Mourinho’s alterations. Bravo, who looked shaky at best following his error, was then lucky not to give away a penalty as he crunched into a tackle with Rooney, following a poor touch, but referee Mark Clattenburg waved play on. United thought, for the briefest of moments, they were back on level terms twenty minutes from time as Rashford beat Stones to the ball with a brilliant burst of pace but, once in the box, his shot deflected off an offside Ibrahimovic, who had been attempting to draw defenders away from the teen sensation. De Gea, who had enjoyed a quiet spell between the sticks, then had to be at his best to deny Fernandinho and Nicolas Otamendi from a set-piece, while he rode is luck as De Bruyne’s first-time shot hit the post and rolled agonisingly along the line before drifting out of play. Rooney eventually earned a spot in Clattenburg’s book, with a stupid late challenge on Bravo, as he attempted to spook the shaken shot-stopper. Goalmouth scrambles were the order of the day as time ebbed away at Old Trafford, but somehow the Citizens were able to bat away United’s advances and hold on for victory.